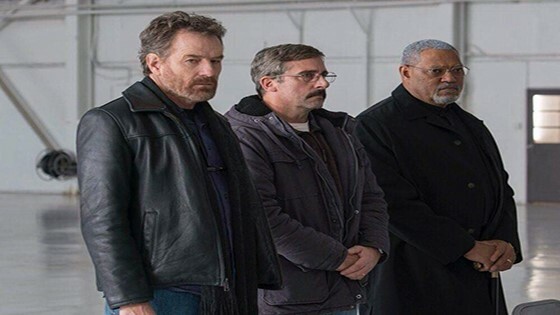 Steve Carell, Laurence Fishburne and Bryan Cranston as a trio of profoundly wounded Vietnam veterans, members of the same Navy unit, who reunite on a road trip to bury one of the men's sons, a casualty of the Iraq War. // One of America's most prolific and ambitious filmmakers, Richard Linklater has now made 21 features in a career that includes a pioneering no-budget indie ("Slacker"), an ensemble comedy time-capsule classic ("Dazed and Confused"), a landmark romantic trilogy (the "Sunrise" films) and a swing-for-the-rafters formal experiment that almost won the Oscar ("Boyhood"). His latest stars Steve Carell, Laurence Fishburne and Bryan Cranston as a trio of profoundly wounded Vietnam veterans, members of the same Navy unit, who reunite on a road trip to bury one of the men's sons, a casualty of the Iraq War. The movie, which opened the recent New York Film Festival, is adapted from the novel of the same name, itself a sequel to "The Last Detail," the 1973 Hal Ashby drama that starred Jack Nicholson. The film is the selection of KWFF special guest critic Joshua Rothkopf of Time Out New York.